Green plants, unlike animals, are able to manufacture their major organic constituents entirely from inorganic raw materials that are obtained from soil, water, or atmosphere using energy provided by photosynthesis. 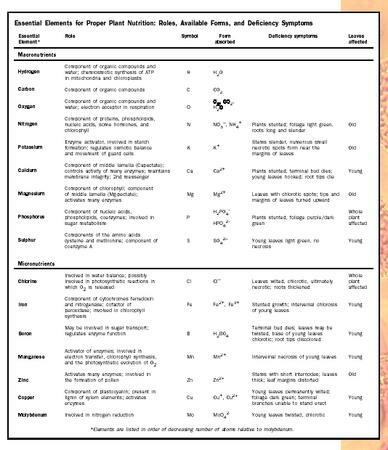 Of over fifty elements found in plant tissues, only sixteen are considered essential nutrients for all plants. Of these sixteen, nine are macronutrients, and seven are micronutrients. Macronutrients are required in high amounts and each is present at levels of greater than 0.2 percent of plant dry weight. Most macronutrients are important constituents of organic molecules, and most have more than one role. Micronutrients are required in small amounts often have special purposes. The seven known micronutrients each make up less than 0.1 percent of plant dry weight. A few other elements (nickel, silicon, and sodium) are considered essential only for some plants. Soybeans require nickel; horsetails require silicon; C4 and CAM plants require sodium. * Elements are listed in order of decreasing number of atoms relative to molybdenum. For an element to be considered an essential nutrient, it must meet the following three criteria: (1) The element must be necessary for normal plant development through a complete life cycle; (2) no other element can substitute for that element; and (3) the element must play a role in metabolism within the plant. Studies to demonstrate whether an element is essential are often very difficult to conduct. Special hydroponic culture in growth chambers that eliminate contamination from the air allows scientists to eliminate a particular element and determine plant response to the deficiency. Structural and Metabolic Components. Carbon, hydrogen, and oxygen comprise a major portion of organic compounds that make up plant cells. Nitrogen and phosphorus are found in phospholipids and nucleic acids. Copper and iron are components of electron transport systems in mitochondria and chloroplasts. The middle lamella that cements adjacent plant cells together is rich in calcium and magnesium pectate. Magnesium is also a component of chlorophyll. Enzymatic Role. Many minerals serve as enzyme activators. Potassium, for example, is involved in the activation of many enzymes. Calcium binding protein (calmodulin) regulates many cellular activities. Manganese is essential in the photosynthetic release of O 2 in photosystem II. Osmotic Role. Potassium plays a major role in opening and closing movements of guard cells of the stomatal apparatus. Hydrogen ion gradients are important in the generation of adenosine triphosphate (ATP) in mitochondria and chloroplasts. Chlorosis, a yellowing of leaf and stem tissue, is a common symptom of mineral deficiencies. In nitrogen deficiency a general chlorosis is exhibited, but in iron-deficient plants, chlorosis is confined to areas between leaf veins. Occasionally, plants will develop a purple coloration due to the production of large amounts of anthocyanins , when certain elements, such as phosphorus, are deficient. Necrosis (death of tissue) may follow chlorosis as deficiencies become more acute. In potassium-deficient plants necrosis occurs along leaf margins, but in manganese-deficient plants necrosis occurs between veins. For several essential nutrients, young leaves show symptoms first, which means that the element is not easily translocated from old to young leaves, as is the case with iron deficiency. Nitrogen, potassium, and magnesium are easily loaded into sieve tube members of the phloem and translocated from old leaves to younger developing leaves. In those cases the older leaves exhibit the symptoms. You should also add diagrams about the route of water and mineral salts in plant nutrition.